Easter was a wonderful day full of food, fun, family, and friends. We had our wonderful neighbors, or rather our self created family, over as well as my mom and step-dad. The kids and adults all played horseshoes and pitched washers in the yard before and after lunch. The day was spent laughing, talking, and of course eating. Monday was more of the same, as it was my husband's birthday. So, we had two days of amazing visiting and feasting. Anyone who reads my blog very often knows I love to cook, especially during big get togethers. I enjoy cooking and entertaining, but tend to get overwhelmed when all is said and done because the kitchen ends up in a disaster. Luckily, I had some new products in the kitchen to help make my life a little easier. First of all, I looked like the "hostess with the mostest" as my Nanny would say in this adorable apron from Flirty Aprons. It kept my clothes from getting splattered and made me look cute all at once. I really loved that it has such long ties, making it fit pretty much all sizes. 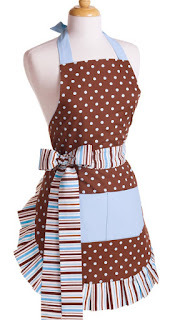 I adore aprons but find many do not fit us plus size ladies. Not a problem with this cute apron! So, I wore my apron and set about making an array of scrumptious food. When it came time to chill my lemon trifle and to put away my husband's birthday brisket, I was so excited to have CoverMate Food Covers available. They stretch to fit just about anything, so getting them over awkward shaped dishes and foods was no problem at all. They are reusable, which is great too! Much more economical than cling wrap and the like. After the festivities I was left with a counter full of dirty dishes. I loathe doing dishes, truly I do. I'm one of those people who seem to get drenched by simply washing a glass. I hate when water runs down your arms and gets all over the place. That is why I was so excited about trying out On The Cuff. This product is basically sponge bracelets that keep you from getting all wet. I will tell you I was very impressed with how well they worked. They keep you dry while doing dishes and hubby thinks they'd be great for washing the car too. Honestly, I can think of lots of chores these clever things would be handy for. All in all it was a fabulous couple of days. These great items helped make all the food prep and clean up so much easier. Don't you just love it when things go smoothly? I hope you and yours had a wonderful holiday too! Sounds like you had a great weekend. That apron is too cute! Found you through MBC and now following your blog! the weekend was fun and we loved being guest! but i am stealing the apron, eating all the trifle and going to find me some cuffs! I want a flirty apron like that but my cheap hubs says why do you need an apron? That apron is just too darn cute!!! Glad your Easter was perfect.